You cannot compare fresh pasta you make yourself to the pasta you buy off the shelves. A lot of people are surprised how simple it is to make. Plus you can store it for a month once you dry it. 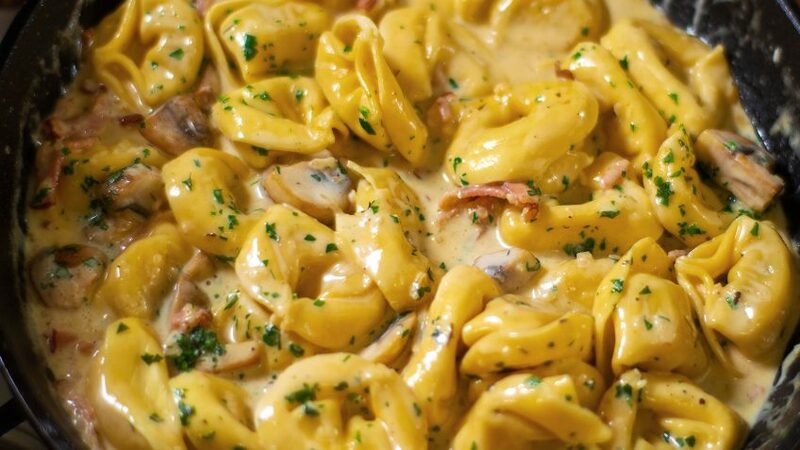 You can cook it in 3 minutes when it’s fresh and once you try fresh there’s simply no turning back, fresh pasta simply rocks! 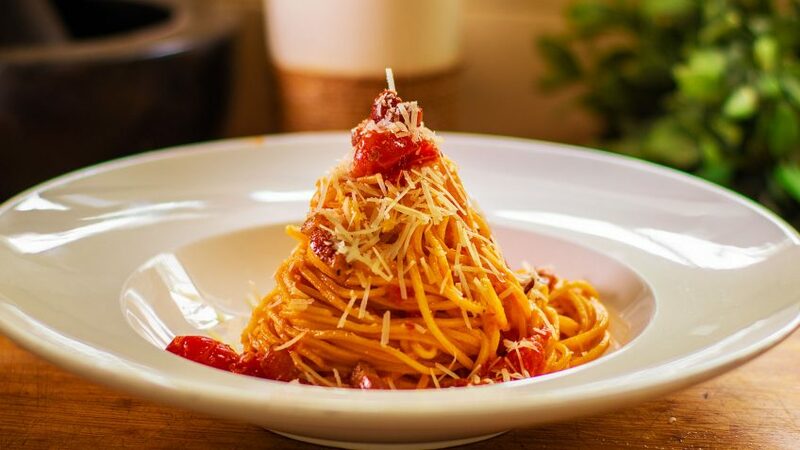 You will need a pasta machine to get perfect pasta, otherwise you can still use a rolling pin and a knife, it will be more rustic but still taste incredible. 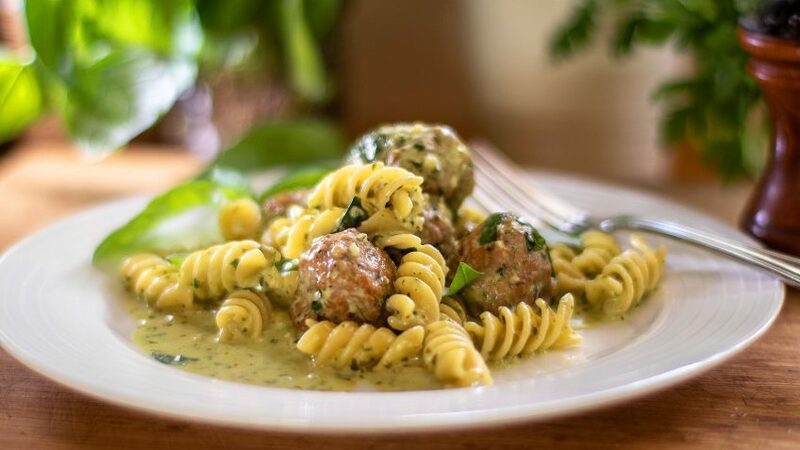 Enjoy pasta made from scratch, watch video! Add the flour to a large bowl or directly on your workbench. Make a well in the centre and crack the room temperature eggs. Give them a beat using a fork and slowly incorporate the flour until it’s all mixed or close to it. Using your hands, start to knead the dough until completely smooth and slightly elastic. If the dough appears and little too dry, add a teaspoon of water at a time. Cover with cling film and refrigerate 30 minutes. Remove from fridge and cut in two. Flatten using the palm of your hand until you have two flat discs. Lightly dust one with flour. Cover the other disk with cling film until ready to use. Set the machine thickness dial to 0 or to wide. The two rollers should be fully open. Feed the pasta disk into the rollers as you turn the crank in a clockwise direction. Fold the pasta in half and give it a light dust. Feed it back into the machine several times until the pasta has a long rectangular shape. Cut the pasta sheet in two, dust with flour and feed through the rollers one thickness number increment at a time until you reach the desired thickness. 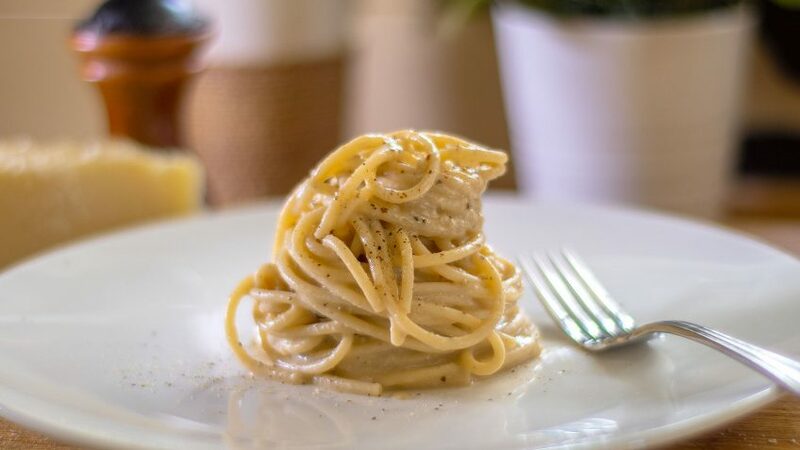 For fettuccine, you want a little thicker. On my machine I use number 5. For tagliolini I use number 7. Chose the thickness that suits you but remember that pasta will close to double in size when cooked. For shaping the pasta, cut the sheets into 10 inch (25cm) long pieces and feed through the appropriate cutting roller. To cook the pasta, simply bring a large amount of water to the boil, and add sufficient salt. It should almost taste like sea water, so don’t just put a pinch in or it won’t be enough. Drop the pasta into the boiling or simmering water, usually when it floats it’s close to being ready. Approx 3 minutes. If you drop it in another sauce, then count a little less as it will continue cooking in the sauce. Do not let the pasta dry, when not working with it, keep covered with damp kitchen towels. 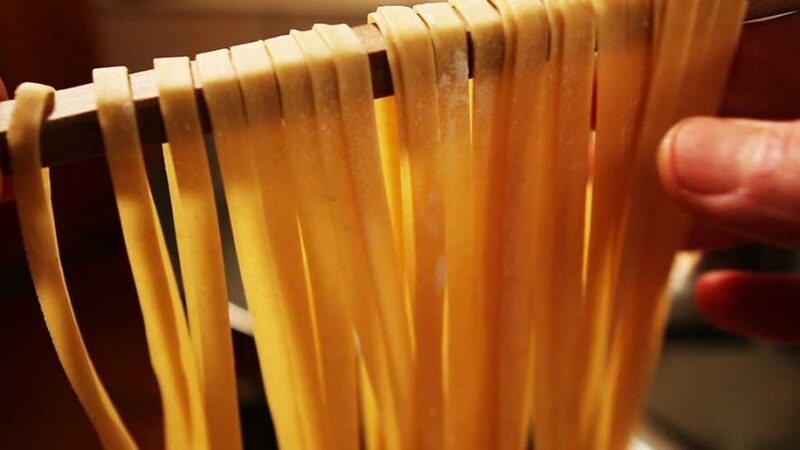 You can dry the pasta for storage by draping them over a clean horizontally mounted broom handle, or a few wooden kitchen spoons, whatever works. This takes approx 5 to 6 hours depending on climate conditions. Once dried, place in sealed tall jars. They should keep for a month or so. Remember that perfect dough should never stick to your hands. 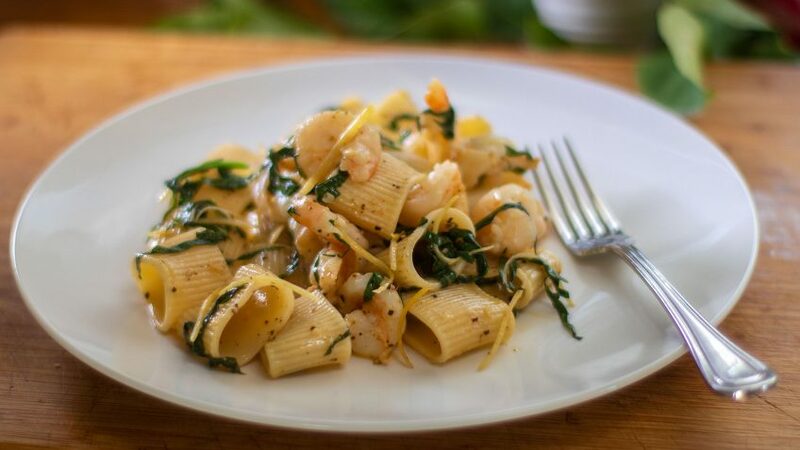 To achieve an even better result of pasta, use half soft wheat flour and half durum wheat flour. Both should always be 00. All pasta machines are slightly different in sizes, but for most machines, for the tagliolini pasta (the smaller one) us the thickness of number 7. For fettuccine as per this recipe, use number 5, a little thicker. The higher the number the thinner the setting. For ravioli use a thinner setting, I use 8. If the rollers are not cutting your pasta, it's because the pasta is too dry. You can fix this by adding a little water to the dough and re-kneading the dough. Then feed through rollers again.